How do you preserve the freshness of the products during delivery? Do not worry you will be surprised at the freshness of the products. All the products will be supplied after your order. We do not send you any stored products. We keep the freshness of the product by packaging them in a very secure way. We guarantee that you will receive them super fresh. The products are packed securely by special packaging materials used by a super professional team specialised in packaging products and thus the products will not be damaged during the delivering process. What should I do if I notice damaged products after taking the delivery? We do package the products in a very special way to not get them damaged in any way. But if your order gets broken due to the delivery, please take a statement down about the courier, take photos and share them with us. You can send an email to the support team to info@gourmeturca.com or just message us on WhatsApp +90 531 819 0048. You can pay by using Visa or MasterCard. Besides there is Cash on Delivery option in Saudi Arabia, United Arab Emirates, Kuwait, Qatar, Oman, Jordan and Bahrain. The number of the states we offer Cash on Delivery option is still going up. Stay tuned. Yes. It is valid in Saudi Arabia, United Arab Emirates, Kuwait, Qatar, Oman, Jordan and Bahrain for now. It is valid for the orders worth $200-. We do send the products after taking the confirmation of the customers by phone. Your order will be cancelled if we do not get the confirmation within 3 days. What is the estimated delivery time just after giving the orders to the delivery company? 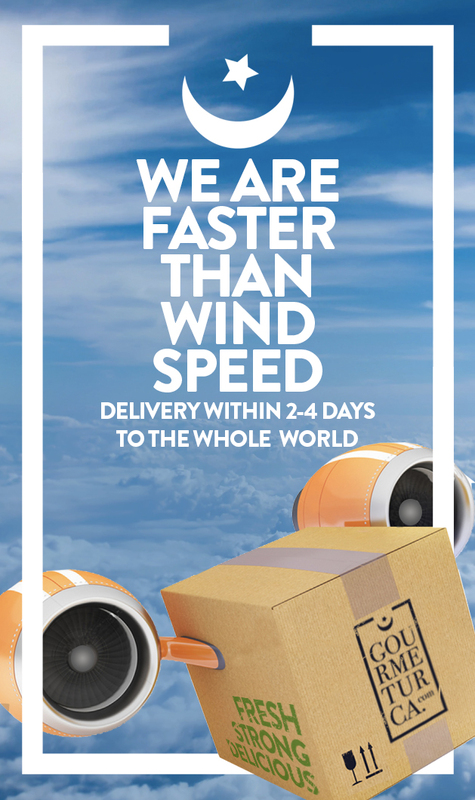 The estimated delivery time is 1-3 Business Days in USA and Europe and 2-5 Business days in other countries, as long as no problem occurs at customs. What are the customs taxes? Why do I pay them? The customs taxes differ between countries, according to each one’s policies. The governments collect taxes on most of goods. As we offer you fresh products, our priority is to deliver you the products super fresh. So to not get the products kept waiting due to the customs taxes we already take 10% from the total price of the products. Can my order get stuck at customs? The estimate of the products that might get stuck at customs is 1-2 from 1000 products. The customs procedures differ between the countries we deliver to. Our team has the knowledge of each country’s customs procedures. For all that, we will resend your order free of charge if it gets damaged at customs. How do you secure your website GOURMETURCA.COM? All the precautions are taken to protect your information sent to our website Gourmeturca.com. In addition, our website provides security by 256-bit SSL certificate and we do not share any of our customers’ information with a third party. You will be notified when you finish from ordering. We will send you an email about the confirmation of your order automatically. Also you can go to your account information on our website to my orders to view your orders information. After finishing your order our professional team will prepare it carefully to deliver it to you. How can I be a member on the website? It is very easy and quick. You can be a member in just one click. Can I order without being a member on the website? Unfortunately, you cannot order if you are not a member on the website but be sure that it is a very easy step. If you are not a member, click here to be right now. It is very easy to change your password. Click here to input your E-mail and change your password. And we will send you a link to your e-mail address to continue ordering. You can change your delivery address before we ship your order by sending us an email to info@gourmeturca.com or message us on WhatsApp +90 531 819 0048. But if your order is already shipped, unfortunately you cannot change your address. Yes, you can cancel it by sending us an email to info@gourmeturca.com or message us on WhatsApp +90 531 819 0048. The delivered orders cannot be canceled. Do the campaigns combine with each other? Unfortunately, the campaigns on www.gourmeturca.com do not combine with each other. It is very important for us that you do shop with satisfaction and comfort. If you have any question, suggestion, recommendation, or complaint, please do not hesitate to tell us. Your recommendations are really of great value. We do work and will keep working to offer you the best service.